Solar power in India is a fast-growing industry and as of 30 September 2016, the country’s solar grid had a cumulative capacity of 8,626 megawatts (MW) or 8.63 gigawatts (GW). In January 2015, the Indian government expanded its solar plans, targeting US$100 billion of investment and 100 GW of solar capacity, including 40 GW’s directly from rooftop solar, by 2022. The rapid growth in deployment of solar power is recorded and updated monthly on the Indian Government’s Ministry of New and Renewable Energy website. Large scale solar power deployment began only as recently as 2010, yet the ambitious targets would see India installing more than double that achieved by world leaders China or Germany in all of the period up to 2015 year end. 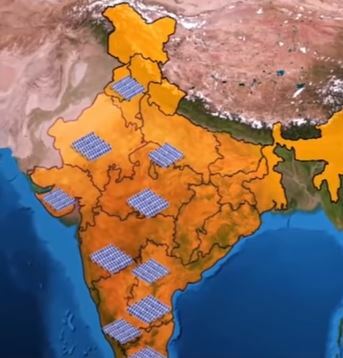 In addition to the large-scale grid connected solar PV initiative, India is continuing to develop the use of off-grid solar power for localized energy needs. India has a poor electrification rate in rural areas. In 2015, only 55% of all rural households had access to electricity, and 85% of rural households depended on solid fuel for cooking. Solar products have increasingly helped to meet rural needs, and by the end of 2015, a cumulative total of just under 1 million solar lanterns had been sold in the country, reducing the need for expensive kerosene. In addition, a cumulative total of 30,256 solar powered water pumps for agriculture and drinking water had been installed. During 2015 alone, 118,700 solar home lighting systems were installed, and 46,655 solar street lighting installations were provided under a national program. The same year saw just over 1.4 million solar cookers distributed or sold in India. In January 2016, the Prime Minister of India, Narendra Modi, and the President of France, Mr. François Hollande laid the foundation stone for the headquarters of the International Solar Alliance (ISA) in Gwalpahari, Gurgaon. The ISA will focus on promoting and developing solar energy and solar products for countries lying wholly or partially between the Tropic of Cancer and the Tropic of Capricorn. The alliance of over 120 countries was announced at the Paris COP21 climate summit. One of the hopes of the ISA is that wider deployment will reduce production and development costs, and thus facilitate increased deployment of solar technologies, including in poor and remote regions. India is ranked number one in solar electricity production per watt installed, with an insolation of 1700 to 1900 kilowatt hours per kilowatt peak (kWh/KWp). On 16 May 2011, India’s first solar power project (with a capacity of 5 MW) was registered under the Clean Development Mechanism. The project is in Sivagangai Village, Sivaganga district, Tamil Nadu. India saw a sudden rise in use of solar electricity in 2010, when 25.1 MW was added to the grid, and the trend accelerated when 468.3 MW was added in 2011. Recent growth has been over 3,000 MW per year (see table below) and is set to increase yet further. Government-funded solar electricity in India was just 6.4 MW per year in 2005. Singh announced that a total of 17 GigaWatts of solar power capacity will be auctioned by March 2018. Additionally, 30 GigaWatts of capacity each will be auctioned in the next three years. As of 31 October 2017, India had an operational solar power capacity of 15.6 GigaWatts. Around 3.6 GigaWatts of capacity has already been auctioned so far. The capacity auctioned this financial year and planned in the coming months until March 2020 totals 81 GigaWatts, while 15.6 GigaWatts is operational and several other large-scale projects are under construction. India could very well surpass the 100 GigaWatt solar power target by March 2022, if all goes according to plan. Up to 4 gigawatts of wind energy capacity will be auctioned by March 2018, which is in addition to the 2.1 GigaWatts already auctioned and the 2.5 GigaWatts likely to be auctioned next month. An additional 10 gigawatts of capacity will be auctioned in the next three years, taking the total to around 29 GigaWatts by 2020. As of the 30th of September, 2017, India had an operational wind energy capacity of 32.7 GigaWatts. These auctions will take up the capacity to around 61 GigaWatts. The Minister for New & Renewable Energy, RK Singh, recently told that at least 5 gigawatts of offshore wind energy capacity could be auctioned in 2018. Feasibility study on one of the proposed sites is in progress while a similar survey would begin at two more sites soon. India plans to auction 10 gigawatts of wind energy capacity each in 2018 and 2019 to reach a total installed capacity of 60 gigawatts by March 2022.